The Hockliffe to Newport Turnpike milestone outside the Wavendon Arms. 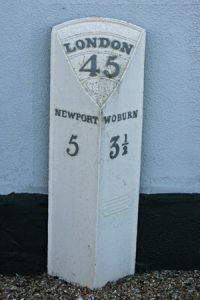 Newport 5miles, Woburn 31/2 miles. Only 45 miles to London! The milestone at the front of the pub dates from about 1800. It is there because the Newport Road was made into a Turnpike (Toll Road) in 1727. The turnpike joined Hockliffe (Watling Street) with Newport via Woburn and was part of the route from London to Manchester. Stage coaches, drovers, carriers, ox-carts, and riders used this route and, while the stages would stop for refreshment at the main ‘posting’ centres such as Hockliffe, Woburn and Newport, the more common traffic would tend to stay at the cheaper inns along the way. In the early 1800s there were some 180 stage coaches a day passing the pub and even more tradesmens carts, animals, and horses. In those days glass was very expensive – too expensive to risk on a bumpy road – and the normal traveller would carry water and ale in leather bottles or flasks. As few people could read shopkeepers and inns would hang signs outside their door to show the passing trade what line of business they were in. The innkeeper here hung a leather bottle outside and it’s this that gave the pub the original name of ‘Leathern Bottel’. So ‘The Wavendon Arms’ actually started out as a transport cafe! There are many similarly named pubs around the country. They were almost all originally turnpike inns.